When Ikea’s future living lab Space 10 teamed up with New York designers Anton & Irene to research the concept of co-living, they decided to set up an online form for people to fill in so they could state their preferences for a harmonious shared living space. They describe this as a type of ‘playful research’, acknowledging that One Shared House 2030 isn’t a scientific survey, but as around 7,000 responses from over 150 countries were submitted, it produced enough material to provide some insight into the way we will live in the future. Respondents were split 50/50 male/female, 85% were aged 18 to 39 years old, and most were either single or in childless relationships, and from Europe, North America and Asia. They stated that, preferably, the occupants of a shared house would have equal ownership of the space, and the ideal housemates would be a diverse mix, but all clean, honest and considerate. Respondents said that they were willing to share utilities, the internet, gardens and work-spaces. However, privacy was the biggest concern for most, who said they would be unwilling to share bathrooms or bedrooms, and would prefer to have their groceries in the kitchen ring-fenced. They would also like to choose how their private spaces were furnished themselves. 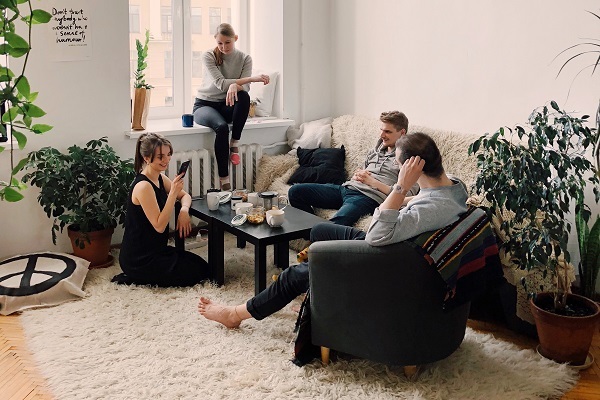 For the majority, the appeal of co-living lay in the prospect of having a better social life, and respondents also said that they would like to live in tight-knit communities of four to 10 people. This is interesting. Two broader trends that we have seen gathering momentum over recent years are single-occupancy living and multi-generational living. If, in fact, people would prefer to live in small communities, are the majority of people living by themselves doing so not through choice, but because circumstances or the lack of such communities have forced them to? Futurist Will Higham told Trend-Monitor that he believed that one reason children are choosing to stay living in the multi-generational family home is to be part of a “small trust group”. So is the multi-generational living template actually one that most people would like to recreate? Not exactly, it seems. While respondents to the online survey stated that other people’s pets would be welcome in this shared community, other people’s small children and teenagers would not be. They also said they would like to have control over the choice of new housemates joining the home – a luxury not afforded to families. However, in both types of home the kitchen needs to be big enough to accommodate communal gatherings, and the numerous bathrooms need to be private spaces that provide respite from the busy home. All this is vital information for architects and designers working on the living spaces of tomorrow. While co-living is a concept that solves many social problems, the loneliness of the single occupant being one of them, many shared spaces currently being built are designed to house hundreds of people. With increased numbers, those all-important elements of community and privacy can end up getting lost.